We are pleased to announce that Langston University, a historically Black college/university (HBCU), has been awarded a grant from the National Institute on Disability and Rehabilitation Research (NIDRR) to fund a new Rehabilitation Research and Training Center (RRTC) on Research and Capacity Building for Minority Entities. The grant was awarded for $4.375 million over a five-year period. The MISSION of the RRTC is to improve minority entities’ (e.g., HBCUs, Hispanic-serving institutions [HSIs], and American Indian tribal colleges/universities [AITCUs]) disability and rehabilitation research capacity and infrastructure by conducting a programmatic line of research examining experiences and outcomes of persons from traditionally underserved racial and ethnic populations and communities and capacity-building efforts. The RRTC serves as a center of national excellence in rehabilitation, research capacity building and research infrastructure research. Dr. Corey L. Moore is Principal Investigator/Research Director. We are also delighted to announce our collaboration with Dr. Myra Reynoso and her colleagues at the Institute for Community Inclusion (ICI) at the University of Massachusetts Boston, Director Joe Cordover and the Oklahoma Department of Rehabilitation Services, and Dr. David Staten at South Carolina State University. To keep stakeholders abreast of RRTC activities and accomplishments, new information will be periodically added to this website and is forthcoming. Research Excellence of Minority Serving Institutions and Minority Investigators: Promising Models for Disability, Rehabilitation, Independent Living, and Health. The MISSION of the RRTC is to improve minority entities’ (e.g., historically Black colleges/universities [HBCUs], Hispanic-serving institutions [HSIs], and American Indian tribal colleges/universities [AITCUs] disability and rehabilitation research capacity and infrastructure by conducting a programmatic line of research examining experiences and outcomes of persons from traditionally underserved racial and ethnic populations and communities and capacity-building efforts. (6)            Pilot-testing an emerging research capacity-building and infrastructure model across 6 different MEs. The LU-RRTC serves as a national resource center for Minority Entities (ME) that are seeking to develop their Research Infrastructure (RI), and to enhance their capacity to engage in disability and rehabilitation research. To this end, the RRTC will initiate dissemination, training and technical assistance activities for developing strong RIs within MEs for the conduct of research, preparation, submission, and management of NIDRR funded research grant projects. Technical Assistance (TA) services will be provided as a part of LU-RRTC interventions for Research Projects conducted to ME and SVRA requestors around the country. The quality, intensity, and duration of TA will vary by system (i.e., ME or SVRA) and the readiness of TA recipients. 4. "Including Veterans in the Workplace"
5. "Quotations and Codes and Memos, Oh My! 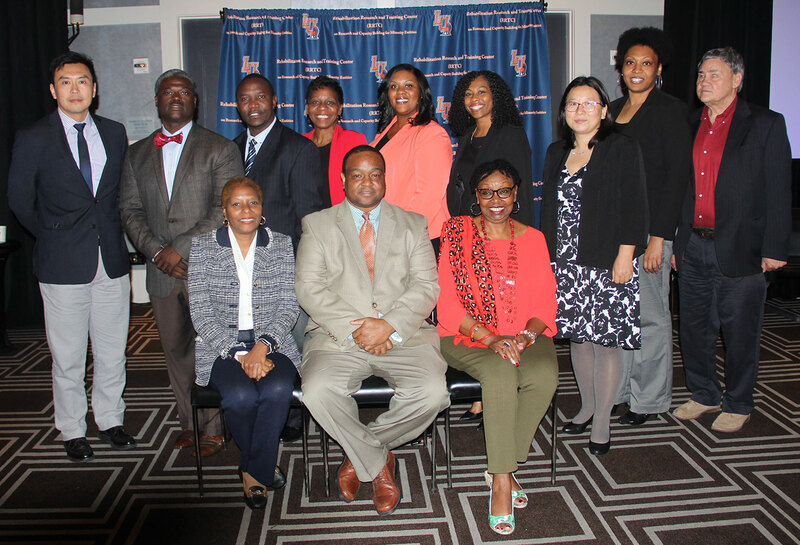 Langston University has convened a highly skilled team of collaborators with expertise that spans the areas of research, capacity building, policy formation, advocacy and dissemination. 6700 N. Martin Luther King Ave.